Last Wednesday (January 21, 2015) Microsoft announced the latest build (9879) for Windows 10 which is not even in beta yet but is still in Technical Preview stage. A couple hours ago I installed this newest version of Windows 10 on my Mac. It looks great and so far is working fine. Below is a picture of it running on my Mac’s Desktop. If you’d like to get Windows 10 Technical Preview for yourself, I’ve got detailed instructions for installing it below. There are about four ways you can go about getting Windows 10. You can install it on an old PC you no longer use because you DO NOT want to install it on your every day Windows machine. Once you have installed Windows 10 to over-write your OS, you have crossed the Rubicon and there’s no going back. A far better way would be to partition your drive and install Windows 10 there. An even better way would be to install Windows 10 on an 8 gig USB drive and run it from there. 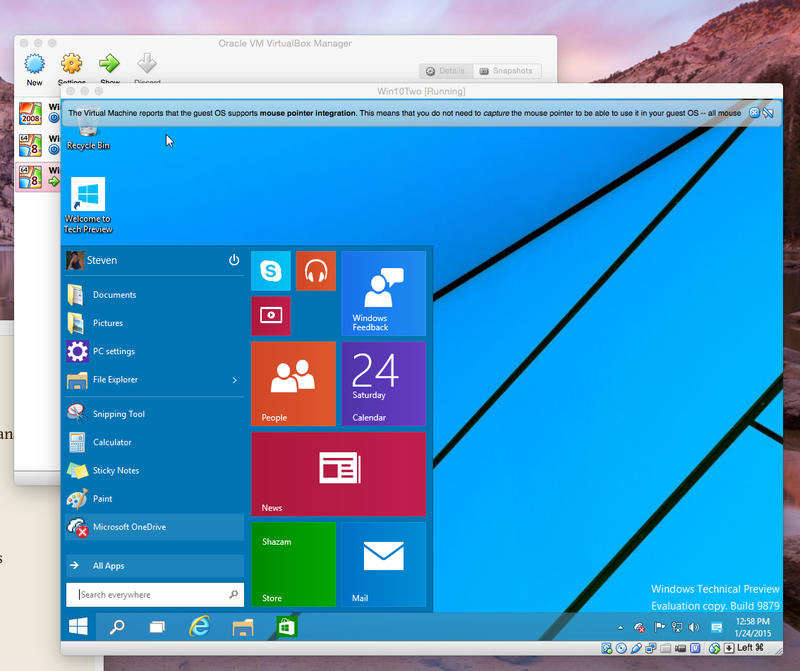 But by far the best way to get Windows 10 for yourself is to run it as a Virtual Machine. What could be more geeky! And besides that’s easiest and safest way to do it. As you can see by the above screenshot, I used VirtualBox as the virtual machine I used to install Windows 10 on my Mac. You can use it on a PC as well. It’s free and it’s easy to use. Just go to Oracle’s website and install VirtualBox and I’ll wait here until you get back. Back so Soon! 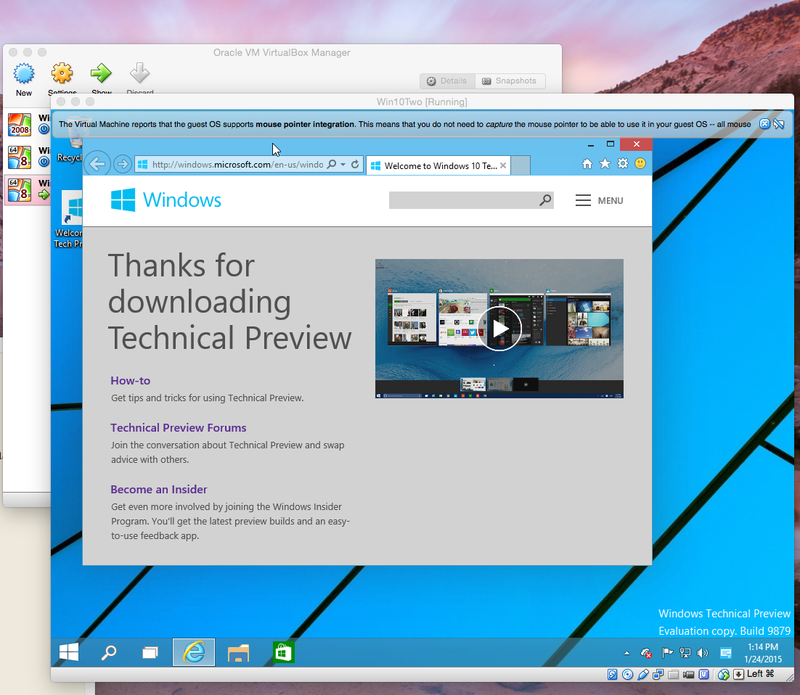 Now you need a copy of the proper Windows 10 Technical Preview IOS file. You can get one at Microsoft’s official Windows Insider Program page by signing up to be an Insider. If your computer has a 64 bit processor, you’ll want to get the 64 bit version of the IOS file. If your computer has a 32 bit processor then get the 32 bit file. Oh by the way, that Windows 10 Technical Preview IOS file is huge – about 4 gigs. It will take awhile. Well after all, you’re downloading a full-blown Windows OS. Once you’ve finished downloading the Windows 10 Technical Preview IOS file, move it to your Desktop so it will be easy to find. Let’s assume you have a free version of VirtualBox and the proper Windows 10 IOS file. The only other thing you’re going to need is your Microsoft account user name and password. Open VirtualBox and click the New icon in the toolbar. In the window that slides down, type “Windows 10” in the Name box and be sure to click to choose “Windows 8.1 (64 bit)” in the Version box. If you downloaded the 32 bit version of the Windows 10 ISO then choose “Windows 8.1 (32 bit)”. Now click Continue. Now just follow the VirtualBox wizard and go along with the default settings pretty much. Memory size – you’ll want at least 2048 MB. For space size you’ll be offered Custom or Fixed so choose Fixed because it’s faster and far simpler. Once you’ve clicked though the wizard, you should see a progress bar as VirtualBox creates the virtual machine that your copy of Windows 10 Technical Preview will run in. If you don’t see a progress bar, you’ve done something wrong so start over and create another virtual machine choosing a different name like maybe WindowsTen. Once the progress bar has run its course, your VM will have been created and you should see it highlighted in the VirtualBox side panel. Now click the Start button in the VirtualBox toolbar and you’ll see a box asking you to “Select start-up disk” so click the little folder icon next to the pull down and navigate to the IOS file on your desktop click it once to select it and click Open and away we go! Windows will start to load. As I was watching Windows 10 load on my Mac earlier today I was thinking “I’m hosed because Windows is going to ask me for a product key and I ain’t got one”. But as it turns out I didn’t need one. Once I typed in my Microsoft user name and password, the Windows setup wizard informed me that a security code had been sent to the email address associated with my account and that I should get that and type or paste that number into the box provided. I did that and entered it and Windows 10 finished installing without a hitch. Running Windows 10 on a Mac is a hoot. You can use your mouse and keyboard without any configuration required. It looks good and feels very responsive. I’ll be checking it out for the next few days and weeks and I’ll be on the lookout for updates from Microsoft. And if I find some interesting stuff I’ll let you know about it. If you found any of this information idiotic or confusing, yell at me in the comments.